This book, edited by Nancy Hedberg and me, came out mid 2007. The book celebrates the life and work of Jeanette K. Gundel with papers by her friends and colleagues. 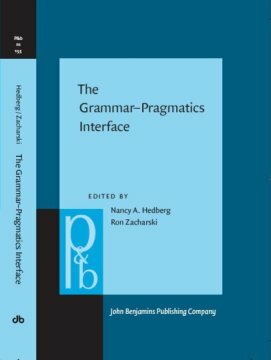 The book has a strong theme: the grammar-pragmatics interface, and it is oriented around Jeanette K. Gundel’s ideas on that theme. The contributions are arranged into three sections: Pragmatic and Syntax, Pragmatics and Reference, and Pragmatics and Social Variables. The first section is centrally concerned with the topic-comment distinction. The second section moves from aspects of reference directly related to the Givenness Hierarchy through to topics related to her work by means of relevance theory, and finally to reference in the broadest sense. The third section moves from describing a close relation between register and form of referring expression through the discourse grammar of apologies to the crucially social discussion of co-constructional utterances that are composed of hearer plus speaker contributions to the discourse. The table of contents and the introductory chapter are available in pdf.